Thanks to ghd pushing the boundaries of technology, you’ll soon be able to style your hair while you dry it with the ghd AURA™ Hairdryer – for speedy ultimate root-lifting volume and super smooth shine! Featuring breakthrough cool-wall™ and laminair™ technology ghd have created a hairdryer that combines drying and styling…and it is available now at our Croydon Hair Salon! Laminair™ technology delivers a 42% more concentrated stream of air than other dryers*, meaning you can work on one section of hair, without disturbing the others, giving you exceptional styling precision and control. Stunningly smooth and shiny results. While the innovative Cool-Wall™ technology keeps the outer casing and nozzle cool to touch, ensuring you can style much closer to the root for impressive volume. 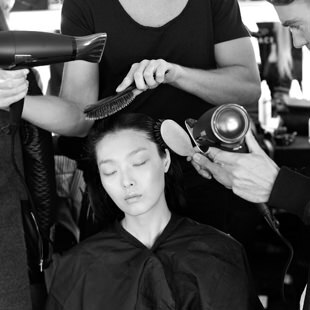 In addition to this, the new ghd aura is 27% quieter and lighter* for a more comfortable drying and styling experience. 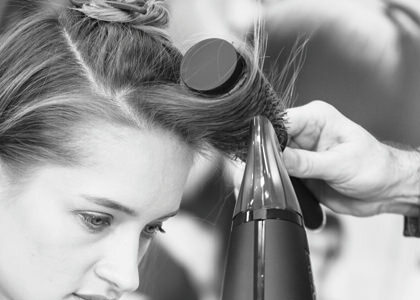 CONTROL | Brand new Laminair™ technology delivers a 42%* more concentrated, nonturbulent air stream so, when working on one section of hair, all other sections stay undisturbed, allowing exceptional precision and control. SHINE | Unlike any other hairdryer, Laminair™ technology aligns hair in a single direction, creating a focused airflow with even speed and temperature, leaving it ultra-smooth and 47% more shiny*. VOLUME | Breakthrough Cool-Wall™ technology keeps the casing and nozzle cool to touch at 44˚C, versus 126˚C*. This innovation allows you to get much closer to the scalp for amazing root lift and volume, setting your style as it dries. QUIET | The next generation brushless motor means ghd aura™ is smaller, lighter and 27% quieter*. 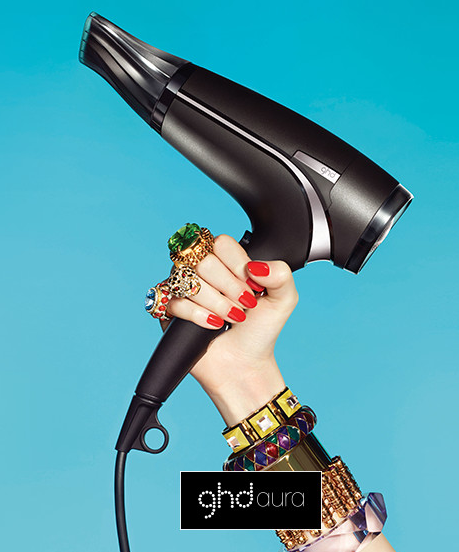 ECONOMICAL | ghd aura™ also makes financial sense, requiring 24% less electrical energy consumption*. 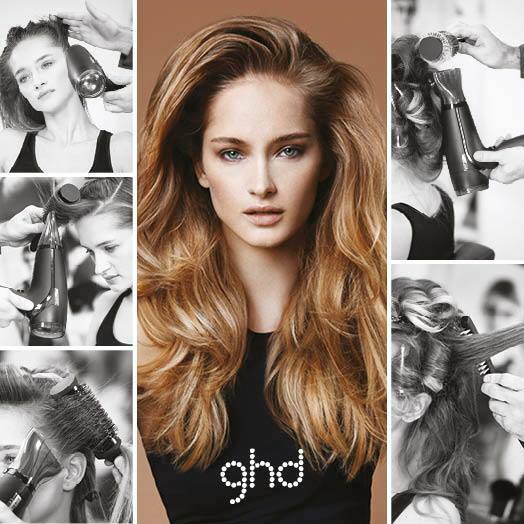 STEP 1: Apply ghd root lift spray. Using ghd aura™ without the nozzle, start to dry with your fingers, lifting the hair, directing the airflow into the root area. 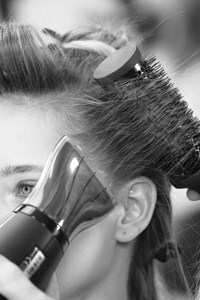 STEP 2: With the nozzle back on, use a ghd ceramic vented radial brush and direct the airflow from roots to the ends. Roll the hair around the brush back towards the head, heating the hair as you roll. Use the cold shot button to set. Unwrap the hair, back brush lightly at the root then wrap into a barrel curl and pin. STEP 3: Take vertical sections directing away from the face and repeat previous step to complete the sides and back of head, wrapping and pinning each section. STEP 4: Taking horizontal sections back to the crown, elevate each section vertically and direct the nozzle into the root area for extra lift. 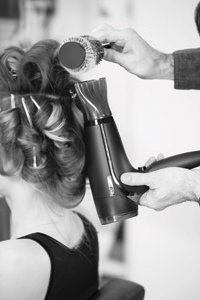 STEP 5: Unpin each section and gently tease at the root before spritzing with ghd final fix hairspray. Shake out with hands then use fingers to dress out to desired finish. If you would like to find out more information on the INCREDIBLE ghd aura™, or would like to book an appointment at our Hairdressers in Croydon, contact us today on 020 8916 0773 or 020 3251 1034 or book online here! This entry was posted in News, Product News, Salon News on August 8, 2014 by .